Baking is one of my favorite ways to start my day! It doesn’t matter what day of the week it is – if I get the desire, I jump to action, pulling out the staples while thinking about the flavors or the mix-ins. 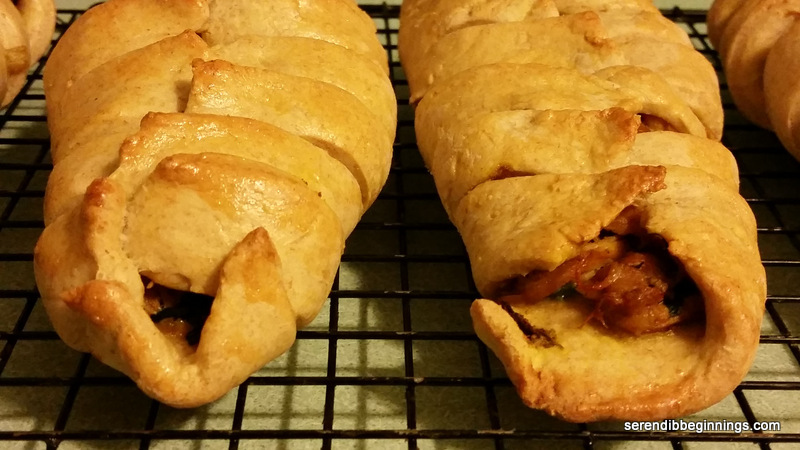 Even though they mostly turned out deliciously moist and flavorful, I was never fully impressed with how they looked. For every batch I pulled out of the oven, my hankering for perfecting the beautiful super crowns you see in coffeehouse muffins kept getting stronger! No matter how much I researched on tips and techniques, my heart would sink every time I pulled out a delicious yet flat muffin batch – well, until this week! So, you see, I didn’t give up! 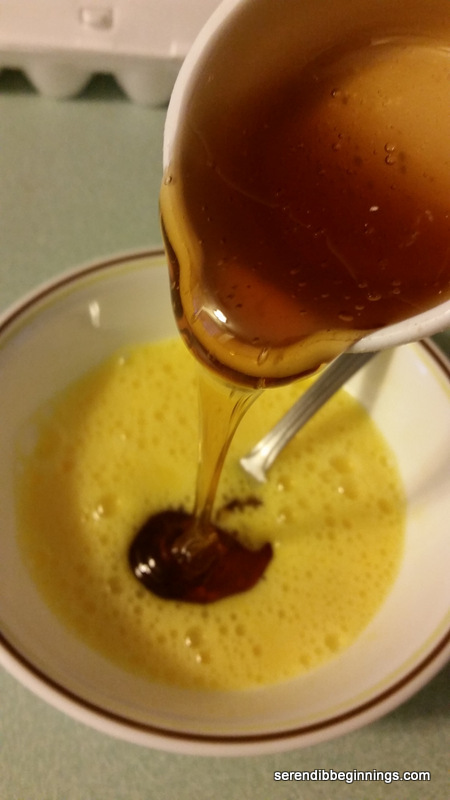 I kept whipping up batch after batch nearly every week! After all, they do make great after school snack or mid morning pick me upper even if they are flat topped! I tried tweaking an ingredient here and ingredient there, while still trying to keep the end product relatively healthy! Yes, “healthy” is a loosely used term, so let me explain what I mean. 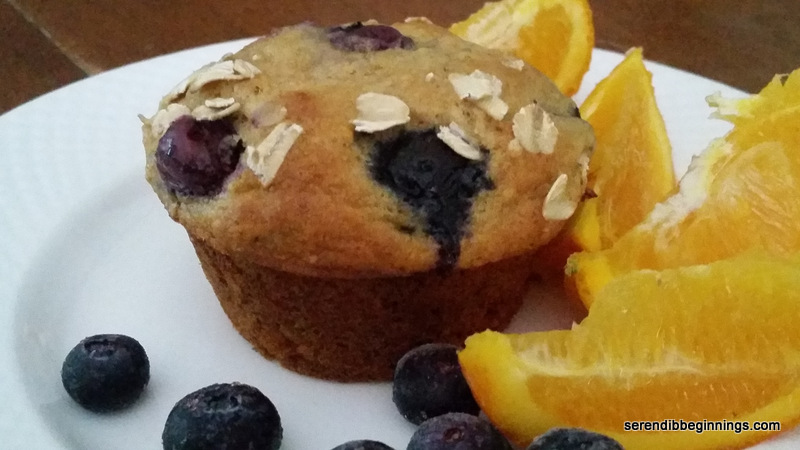 These muffins don’t use much added fat (1/4 cup oil for a dozen), use a blend of whole wheat, all purpose and wheat germ, touch of honey and a bit of boost from 1% milk and fat free yogurt! In my opinion, this probably qualifies as relatively healthy compared to what you will pick up at the grocery store or your favorite coffeehouse. 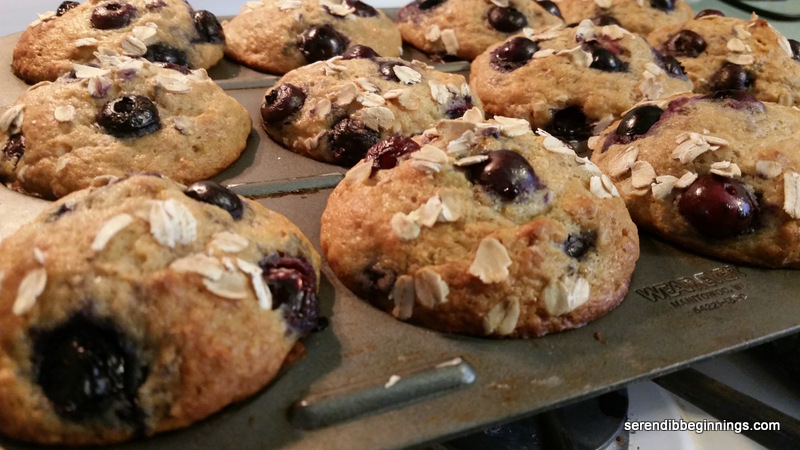 And the best part….this recipe is awesome for those of you who want to use few different mix-ins – like the blueberries and chocolate chip versions I made here. Read on to find out more! So, unlike what you might read on the internet about having to overfill the muffin pans to achieve the sky-high crown effect, these muffins do just great with about 3/4 fill. They puff up so beautifully that I sometimes catch myself taking a few peeks before they are done! 🙂 And the golden color….You have to try this to experience the joy yourself! So, I hope you will grab couple of mixing bowls and go to task! Enjoy! 4. 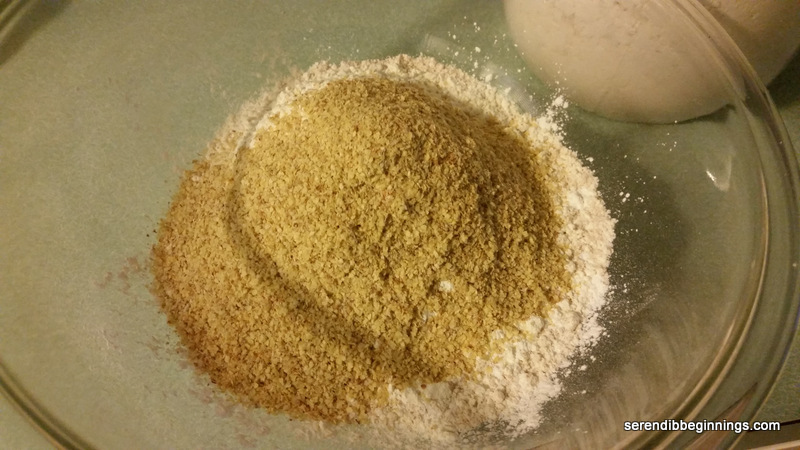 Add the wet ingredients to the dry and gently fold in just until the flour mixture gets moistened. DO NOT OVERMIX! 5. Scoop about a tablespoon of batter into each greased well. Add a few chocolate chips or berries or whatever you choose. Divide rest of the batter evenly among all the wells and top with few more chocolate chips or other add-in of your choice. 6. 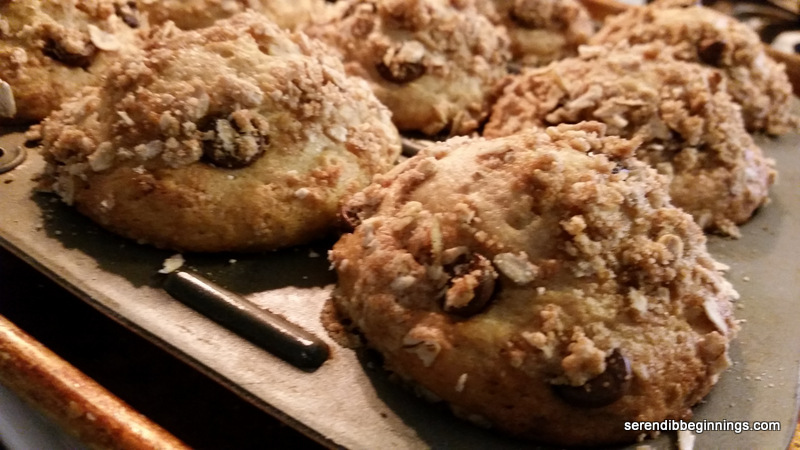 If using streusel topping, divide it evenly among all the muffins. 7. Bake for about 20 minutes till the crowns are puffed up and beautifully golden! 8. At the end of baking, remove the pan and let the muffins cool for a few minutes before moving them to a cooling rack to cool completely. You can refrigerate these muffins for 3-5 days. 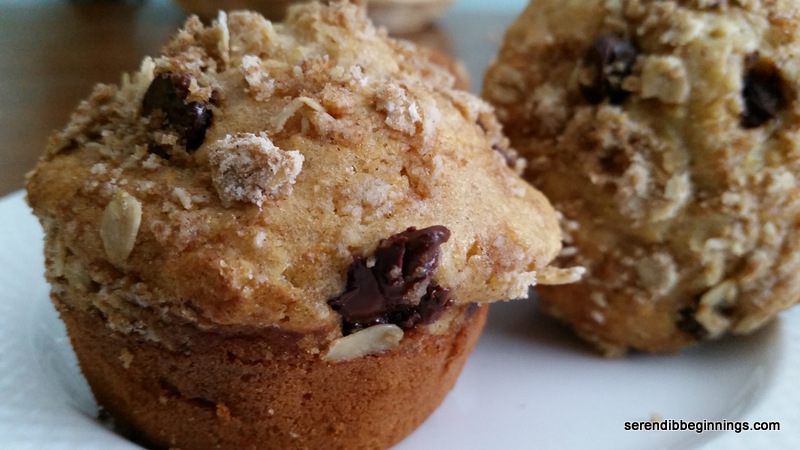 Because of the low fat content, the muffins taste better when you microwave for just a few seconds! For all the sighs and groans I hear about working with yeast, I must say, they are not that difficult to work with – that is, provided you have unexpired yeast that you know to keep alive! You think that sounds a bit gory – like some man eating zombie or something! May be I feel that way because I forced myself to watch the much anticipated (not by me by any means) return of The Walking Dead last night! Eeewww…to stupid and….stupid if you ask me! After enjoying Will Smith’s “I am a Legend”, I am content with not watching any more zombie nonsense! Anyway, back to yeast! Yes, so if you have braved to make a simple pizza dough, you have passed the threshold into the vast untapped potential of bread making! If you are still contemplating your first encounter with these little eukaryotes, then, fear not…just grab yourself a refrigerated pizza or bread dough from the store! 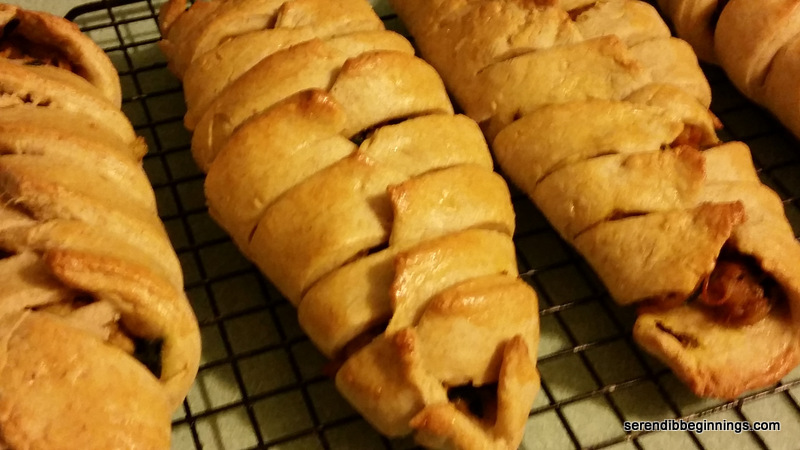 Yes, yes, there is always a place for Pillsbury’s in everyone’s kitchen! This recipe is pretty simple and straightforward. 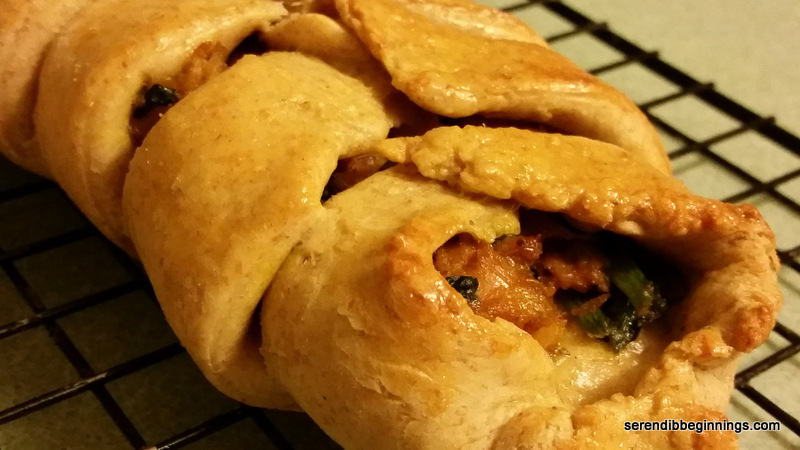 Make a savory filling of your choice (let your imagination run wild), roll out the dough, place the filling, score opposite ends of the dough (they will look like a millipede or something similar with a gazillion legs), braid, brush with egg wash and bake! Trust me…it’s a fun art project like endeavor. Once you bake these, you will want to make more! They keep well in the refrigerator for a few days and make a great lunch (make them into single-serving sizes) to pack – for kids, for your spouse, for YOU! If you make them small enough, they also make a great snack for a road trip – depending on your filling and your own taste buds, they taste fine at room temperature as well. So, I hope you won’t skim this recipe and take a pass! Give it a try and I am pretty sure this will become a keeper! 2. Heat 1 tablespoon of olive oil in a non-stick skillet over medium high heat. Cook the chicken breast or thighs on each side till golden brown, lower heat to medium and continue cooking for another 5-7 minutes on each side till the chicken is cooked through and all juices run clear. You may need to adjust the cooking time depending on the thickness of the meat. 3. Remove cooked chicken to a platter and let rest. Once the chicken is cool, shred the meat or dice into tiny cubes. 4. Return the pan to heat and add the remaining tablespoon of oil. 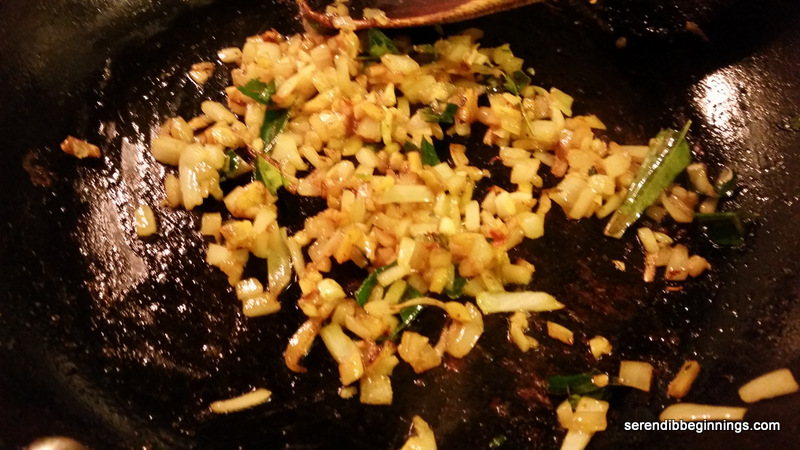 Saute onion and garlic till fragrant (about 2-3 minutes). Add the ground cumin and paprika, stir to mix. Now, stir in the spinach. 5. 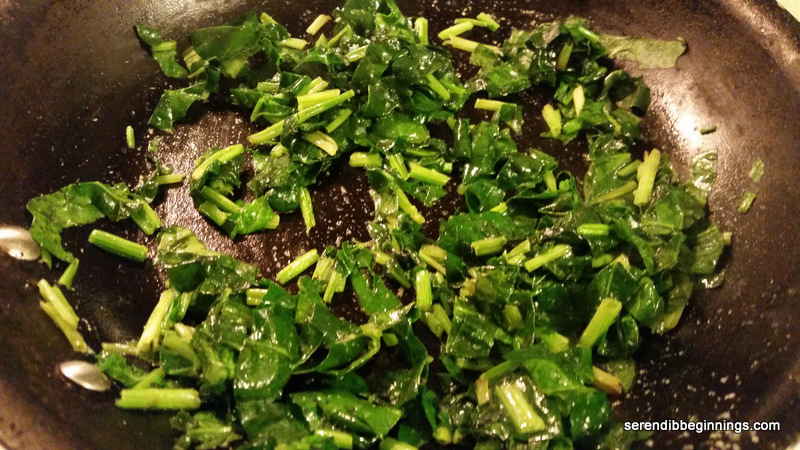 Cook the spinach mixture till any remaining liquid evaporates. Add in the shredded chicken and heat through to blend in all the flavors. 6. 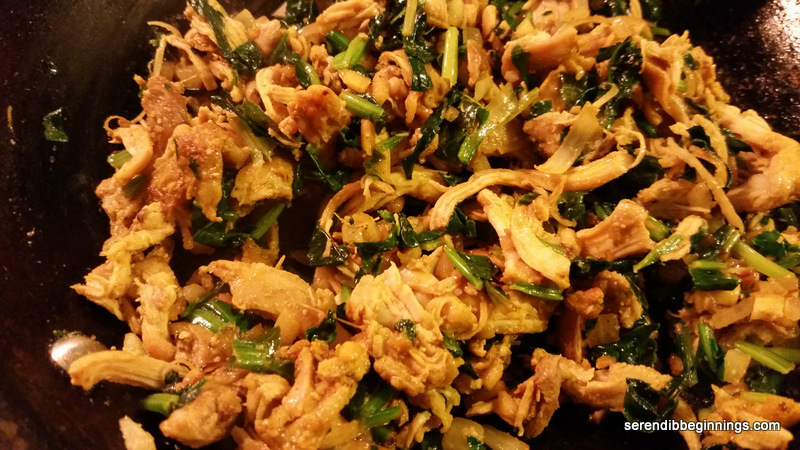 Let the chicken-spinach mixture cool down to room temperature. 7. Divide the dough into 4 equal portions and roll out into a 1/4 inch thick rectangle. 8. 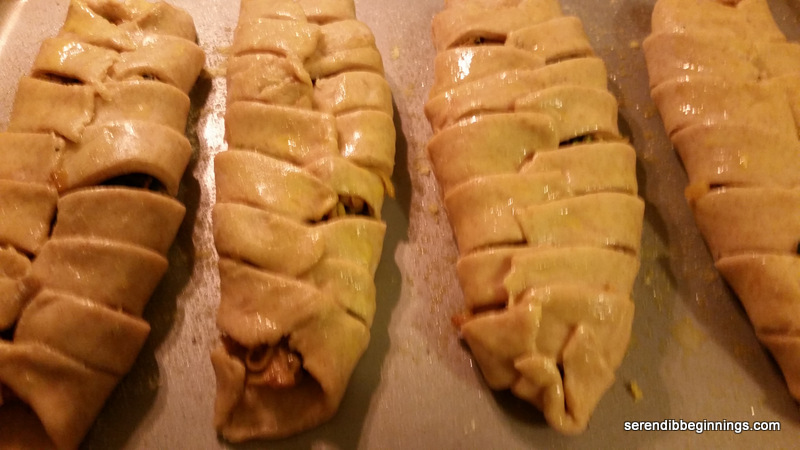 Place 1/4th of the filling along the center of the dough, lengthwise, leaving about 2-3 inches on each long side. 9. Using a sharp knife, cut 1/2 inch strips along each side of the filling like shown in the picture. Criss-cross the strips like braiding and tuck in the ends. Brush with the egg wash.
10. Place all the braids on a parchment lined sheet pan and bake for 18-20 minutes till the tops are golden brown and the dough is cooked through. You can serve this immediately with a dipping sauce of your choice or refrigerate for later enjoyment! 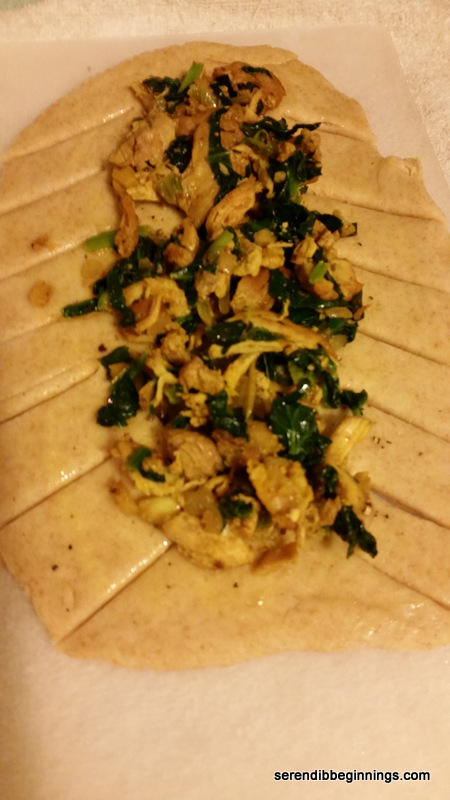 * Instead of cooking the chicken, you can certainly substitute leftover grilled or poached chicken. Just skip steps 2 and 3!